The summer sessions at Black Mountain College were all imbued with an exceptional, energetic spirit differing from the typical school year, though the summer institute in 1948 could be considered the most powerful and innovative one. “It was that special time, about which much has been written; with Willem DeKooning, John Cage, Merce Cunningham, Richard Lippold, Josef Albers, of course, and also Buckminster Fuller.” (1) The latter “a very dark horse” (2) at that time. Generating trend-setting collaborations such as the performance of Erik Satie’s “The Ruse of the Medusa”, the creative environment gave rise to the creation of Kenneth Snelson’s sculpture, “Early X Piece”. Sculpture by Kenneth Snelson – iron, wire, tread and plasticine, 45 cm high; Release No. : BMC Doc. #4b-Snelson, Photographer Kenneth Snelson, Winter 1948. Courtesy of Regional Western Archives. Sculpture by Kenneth Snelson – iron wire and plasticine, 55 cm high; Release No. : BMC Doc. #4 a-Snelson, Photographer: Kenneth Snelson, winter 1948. Courtesy of Western Regional Archives. Returning to Pendleton after the summer, Snelson started experimenting with small moving mobile sculptures, leading, step-by-step, to the “Early X Piece”: Initially weighting them with clay, he soon replaced the swivel points with thread slings building up tension in order to ensure stability. For the first time tension and compression members in a model have had seperated in a linear fashion. As a result even if put under pressure the construction would maintain its form. The mechanical forces of compression and tension are internally locked. By focusing on the structure itself, Snelson reveals its underlying forces, not only making the invisible visible, but also unifying function and form. (8) “Early X Piece” can be considered Snelson’s first sculpture, in which art and technology meld. Snelson enrolled in the summer sessions in 1949 and showed his discovery to Fuller. 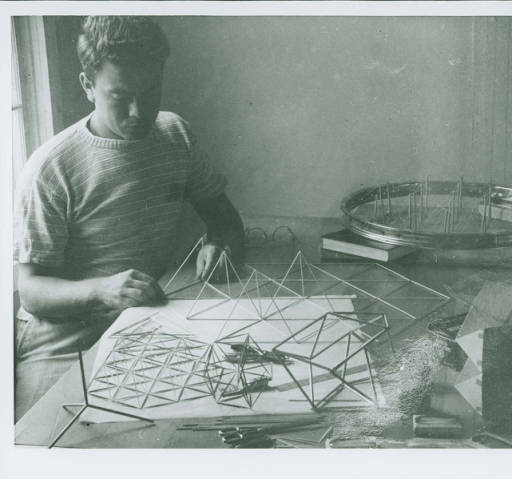 The latter was so intrigued by Snelson’s work that he adapted the construction into his own work, especially into his architecture, describing it as tensegrity, a term coined by him, which comprises the words ‘tension’ and ‘integrity’. (9) According to Snelson, Fuller published the discovery as his own invention based on a photography showing Fuller holding a modification of “Early X Piece”, without crediting it to Snelson, which led to the breaking-off of the men’s friendship. (10) Leaving Black Mountain College at the end of the summer, Snelson never returned. In the following years, he successfully pursued his career as a sculptor, continuing to focus on the synthesis between art and technology. Notwithstanding the incident with Buckminster Fuller, which cast a shadow over Snelson’s stay at Black Mountain College, the two summers Snelson spent there left a decisive mark on him. They were a watershed in his artistic career, whereas “Early X Piece” can be considered the starting point of his shift from painting to sculpture. 9 See Katz, Vincent, Black Mountain College. Experiment in art (Cambridge (MA): MIT Press, 2013), 150. 10 See Harris: Black Mountain College Project.